Like all Dog Breeds, Cavaliers need plenty of exercise. 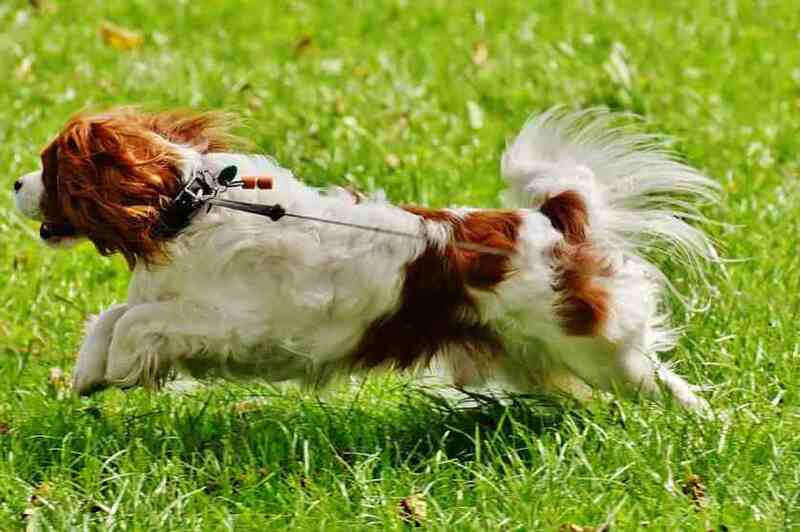 While Cavalier King Charles Spaniel Exercise Requirements are fairly modest, they still need multiple daily walks. Remember your Dog needs to go to the toilet just as often as you, and regular walks provide this opportunity away from the home. The question shouldn’t be if you should exercise your King Charles Cavalier Spaniel, it should be how much. There are a lot of benefits to keeping your dog as active as possible. Even just 20 minutes a day can have a major effect. The amount of time needed for a dog depends on size, breed, and age. In this article, we’ll cover why exercise is important, how much your King Charles needs, and a few ideas for you to try. Just as humans can benefit from exercise so can dogs. Dogs were bred to help humans with different tasks and they’ve been working with us for centuries. Now dogs have become mostly companion animals. Since we no longer use them for work as much this limits the dog’s opportunities to burn energy. Without this work, the dogs have no outlet. This absence of an outlet can have great negative effects on your King Charles Cavalier Spaniel. How much exercise does a Cavalier King Charles Spaniel need? Dogs that are not given enough exercise commonly have these behavioral issues: destructive chewing, scratching, digging, wanting to explore, jumping on people, knocking things over, rough play, excessive predatory behavior, and attention seeking behavior. These are all related to not exercising enough. If that’s not enough to convince you your King Charles Cavalier Spaniel needs exercise then you’ll need to take a look at the benefits of exercising your dog. Exercising will help reduce or get rid of all those behaviors listed above. Other positive effects of exercising your dog are: keeps them agile and limber, reduces health risks, reduces digestive problems, builds confidence and trust, and keeps weight under control. One of the best things you can do for your King Charles Cavalier Spaniel is to exercise them. Now we know why it’s important to exercise your King Charles. Now let’s look at Cavalier King Charles Spaniel Exercise Requirements. The amount of exercise depends on size, age, and breed. King Charles fall into the toy breed category. They are smaller dogs. This means you wouldn’t have to walk King Charles as far as a Labrador to get the same effect. About 10-20 minutes of play a day is ideal. Yes, playing counts as exercise. The great thing about a smaller dog is that you can exercise it indoors. Many owners think that just letting your dog outside is enough. Your King Charles will want you involved. So you should spend time with it. Depending on your dog’s age, 10-20 minutes a day can change you and your King Charles lives for the better. How often should you walk a Cavalier King Charles Spaniel? One of the biggest responsibilities which come with owning a dog is the exercise you will need to give it. For many people, this is also one of the main motivations to get a dog as they wish to have a reason to go for walks and spend time outdoors. The amount of exercise a dog will need depends very much on its breed. The Cavalier King Charles Spaniel is a small dog which is relatively easy to take care of in terms of exercising. As a general rule, the Cavalier will need around one hour of physical activity a day to keep it fit, healthy and happy. This could take the form of playing with a toy, running after balls, frolicking with a fellow dog or indeed, going for a walk. Being a toy breed, the Cavalier King Charles has smaller legs in comparison to many other breeds. This means it will not be able to cover as much distance as a larger dog and will not be able to walk for as long as a larger dog before tiring. With that said, the Cavalier is known to be an active and energetic breed which enjoys regular walking. So, just how far can you walk a Cavalier King Charles Spaniel? Each dog will vary, but the average maximum distance you could walk this breed comfortably will be around four miles. However, if you build up your dog’s stamina you could walk it much further – people have been known to go on ten-mile-long hikes with their Cavaliers! When it is still a puppy, a good distance, to begin with, would be half a mile. When it grows larger, your Cavalier will enjoy long walks. Judging the distance your dog will be able to walk will be largely intuitive – whilst out walking, look for signs of fatigue and head for home if you feel your pal slowing down. If you’re going out for a particularly long walk, or if it is a hot day make sure to bring some water for your dog as well as yourself. 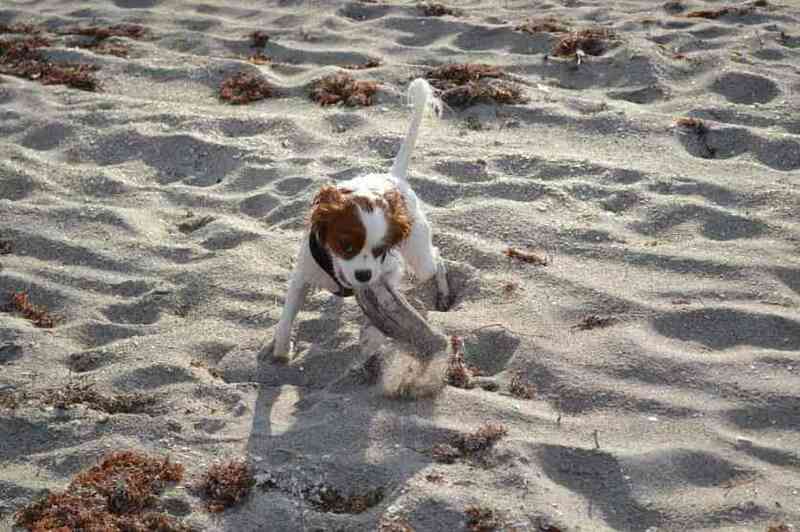 Cavalier King Charles Spaniel’s are generally very happy to travel by car, so you could choose to drive it to the beach or forest in order to walk it there. 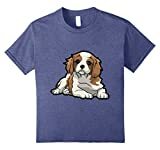 Cavalier King Charles Spaniel Running? There are tons of ways to exercise your King Charles Cavalier Spaniel. Walking them or maybe jogging with them is obvious. However, they probably couldn’t handle a long run, so don’t expect to train for any Marathons with them. You could get a toy and play fetch with your King Charles Cavalier, try running away from them after you’ve thrown the toy and you’ll be amazed at their ability to catch up with you. There are also agility classes you can sign your dog up for. Fetch is always a good choice as well. There are many things you and your King Charles Cavalier Spaniel can do together that can burn off any and all excess energy. All in all, the Cavalier is a versatile little dog which can walk moderate distances and enjoys being exercised each day. Like most breeds, the Cavalier requires daily exercise to keep it in good physical and mental condition. Taking it for at least one walk per day is recommended but you could take it out for several throughout the course of the day. A quick word of caution: when you walk this breed near a road, make sure to put it on a leash. 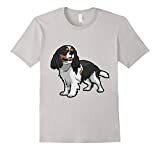 The Cavalier King Charles Spaniel is known for its lack of road sense and would readily run into the path of oncoming vehicles if it were chasing something.